You wait intensely. Your ears are cocked to the radio. You double-checked every switch in your F-22 cockpit. Everything is green. You are flying in a lazy racetrack pattern well outside the enemy's AAA coverage. You know that Captain Smith, an AH-64 pilot and a buddy of yours, is prowling down there somewhere. "Alpha, targets confirmed, cleared hot!" you heard the controller in your radio. "Roger," Capt. Smith answered. He pops up from his hiding place, locked his missiles on the few SAM sites near the target and let loose a salvo of missiles, shutting down the site. "Bravo, coast is clear!" you heard him shouting at you. You ease the throttle of your F-22, arms your Mavericks and dive to the target area. You saw the convoy you are supposed to attack and made several passes. Within a few moments, only wrecks remain. You head home to base. Another successful mission. Is this a scene from Desert Storm? The infamous Highway of Death? No! Welcome to the world of A.T.A.C., a unique sim from Microprose. This sim is unique for several reasons. Firstly, instead of whacking some Communist or Middle Eastern butts, you are fighting the drug lords in South America. Secondly, this sim allows you to fly a fighter, the F-22 and a helicopter, the AH-64. A.T.A.C. allows you to fly and manage a mixed force of F-22s and AH-64s in your war against drugs. This is, in my opinion, the only sim in recent memory to mix flyable helos and fighter. Yes, hacks exist for Jane's Fighter Anthology to fly the helicopters and recent versions of Microsoft Flight Simulator have helos, but you know what I mean. Graphically, this sim is a mixed bag. 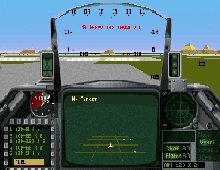 Literally, because the terrain resembles that from Air Warrior, the F-22 cockpit resembles the F-16 cockpit from Falcon 3.0 (a prophecy to the acquisition of MicroProse by Spectrum Holobyte? ), the AH-64 cockpit resembles the one from Gunship 2000. The gameplay is not particularly exceptional, in my opinion. Other than the unique setting mentioned above, the missions boils down to the standard strike missions with little variety and might get boring after a couple of days. The management side of the sim is not as interesting as the one from Falcon 3.0. The flight model and avionics are generally over simplified, too, and will put off realism buffs. Finally, you might find A.T.A.C. interesting as long as you are interested in its unique setting. For purely flight simulation interest, it might be better to dust off your old copy of F-117A or Gunship 2000.